Farewell King George! 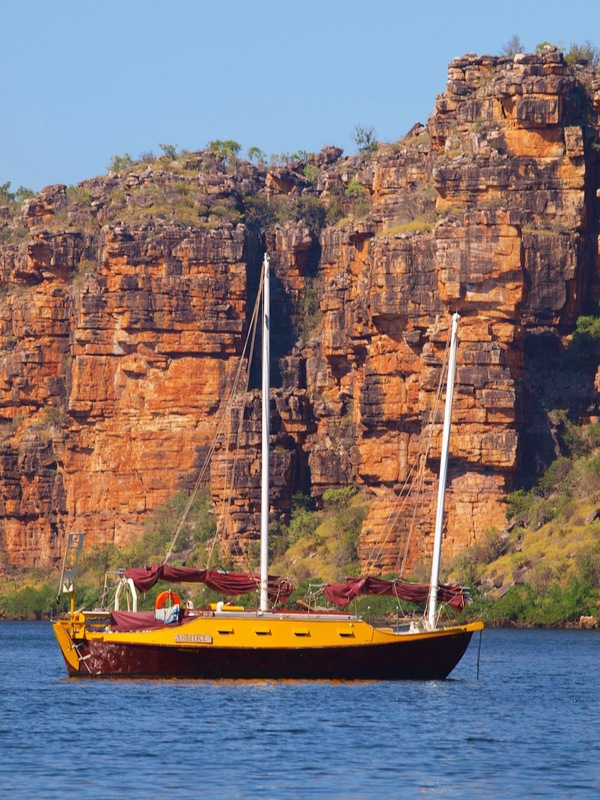 The best of the Kimberley we think. 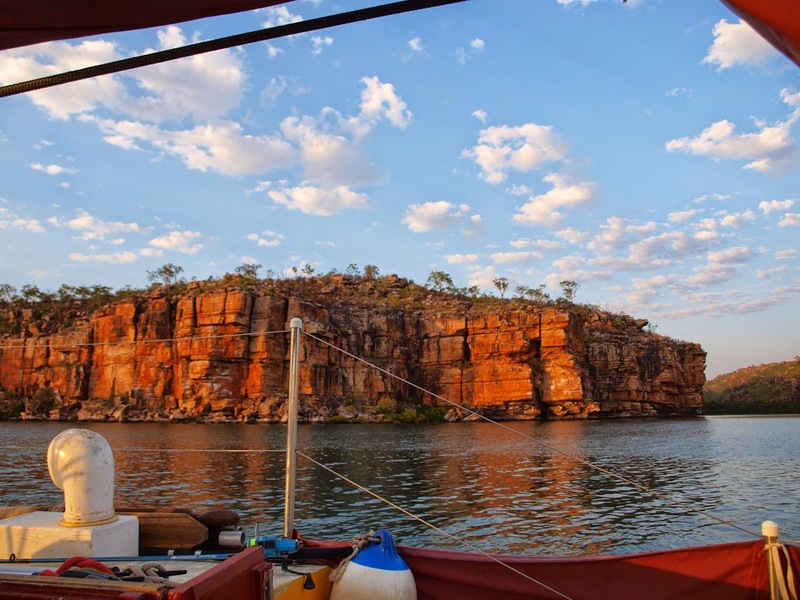 We were leaving the Kimberley, setting off from the King George River. 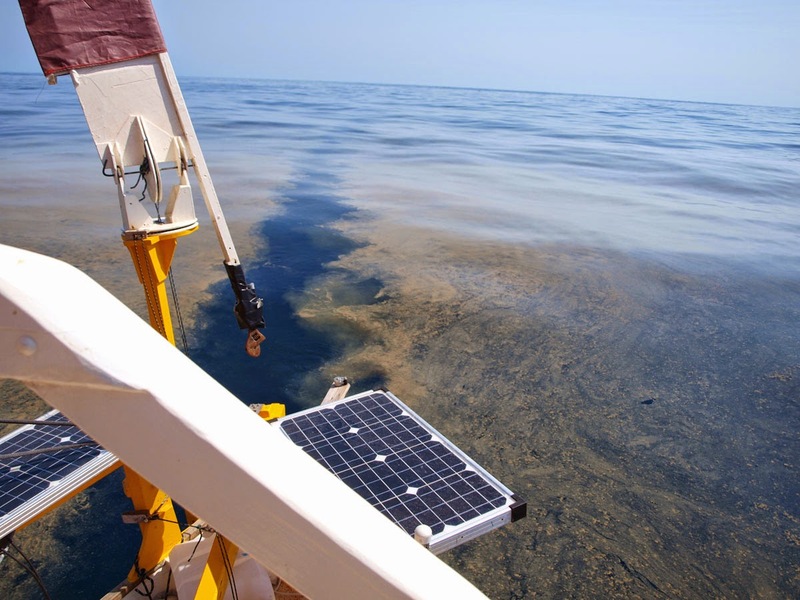 We had before us the potentially nasty stretch of water known as Joseph Bonaparte Gulf, or alternatively known as "Blown apart Gulf"... 220Nm of it to Darwin. On the way out a cat crossed the river mouth, “Dog on Cat”. Susie hailed them on the VHF to get weather info, should be plain sailing was the reply, all westerlies which sounded good to us. It was an easy run in light breezes, Ashiki made 70 miles the first day, 60 the second and 50 the third. Adverse currents and calms eventually getting the better of her. But not to worry, it was all lounging around reading our kindles, as the windvane connected direct to tiller did a sterling job leaving us with little to do, most the time.. The few times we did motor, and never more than an hour, involved hand tillering which we don’t like, as the windvane doesn’t work in that case. Oh for an electronic tiller pilot. The winds were quite flukey during the last couple days too which doesn't suit the wind vane either, lots of climbing into the cockpit for readjustments, through the night even. 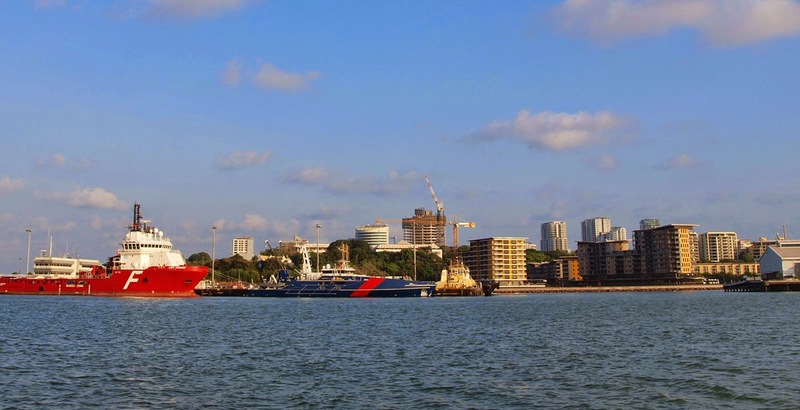 Darwin was a sight for sore eyes, the first sign of civilisation for two months. Its looking quite different to what I expected, shimmering white towers on the horizon, like a mini Singapore !? Eh… Darwin? 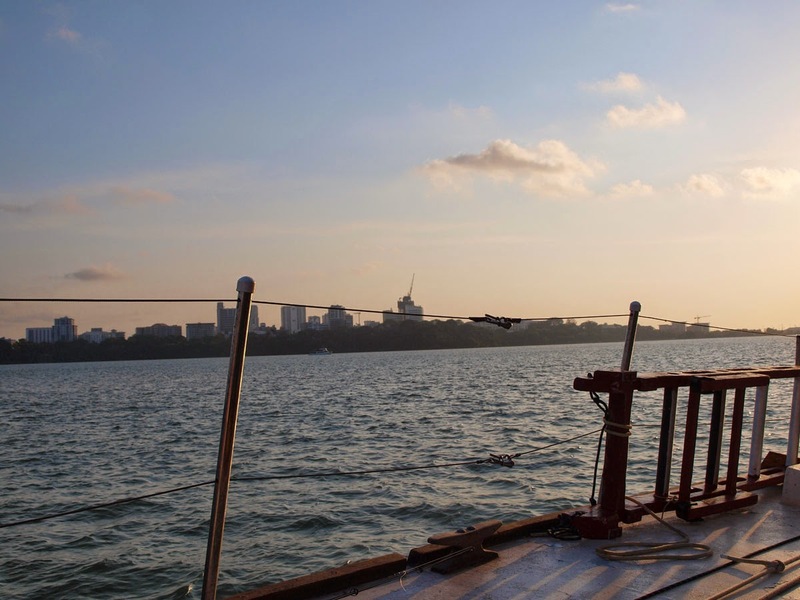 The tides defeated us again on the final approach, electing to anchor across the bay from the city, in one of the few spots without marine cables, gas pipelines etc which are generally anchoring prohibited areas. 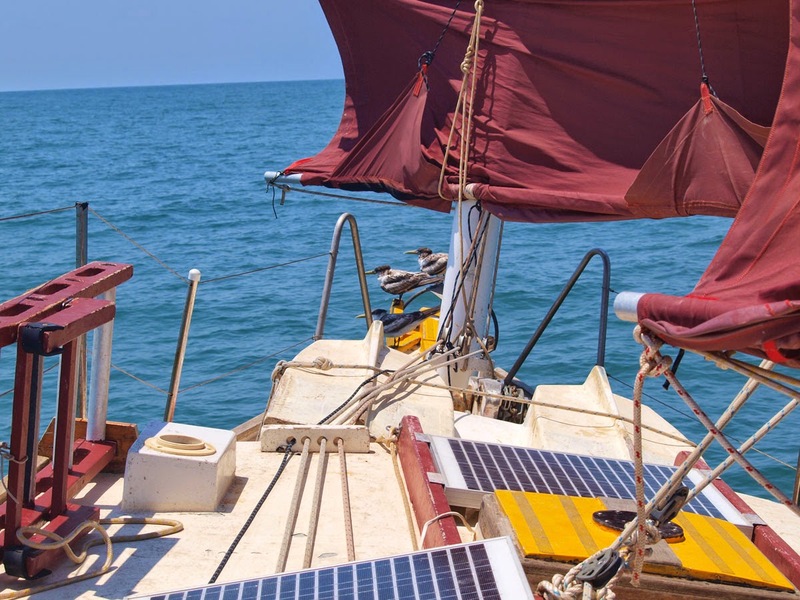 By morning we sailed, with all panels up, rounding the bottom of Darwin and anchored in Frances Bay near the mouth of “the creek” just as the tide was turning, and with the motor conking out.. Ashiki sailed the last 30 yards to drop anchor. (New spark plug was needed.) 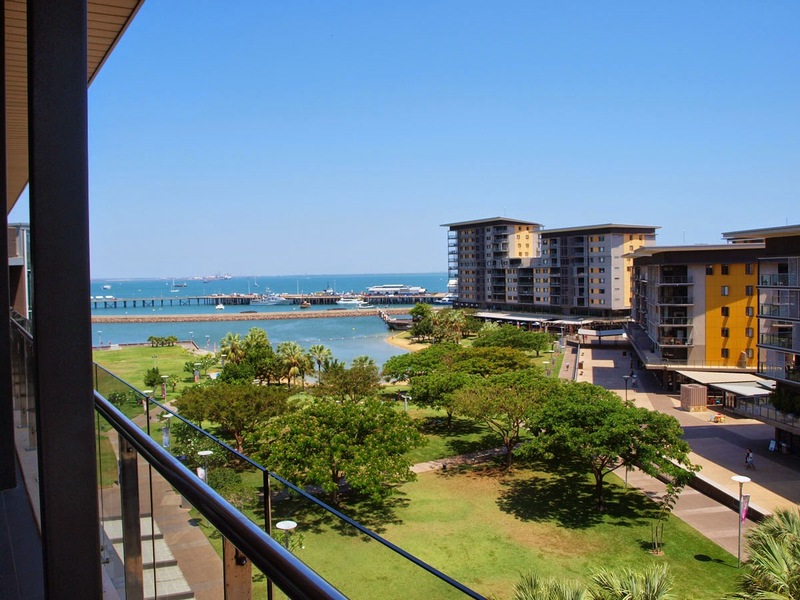 Our first foray into Darwin was via the famous Dinah Beach Yacht Club. I say “famous” because the place for me was immortalised in Kris Larsen’s book “Monsoon Dervish”. Quite the tome, highly recommended. (A bloke who sails out of Tasmania with $1.50 in his pocket, his only piece of nav equipment is a compass, which doesn’t work because it’s a steel boat and tosses it overboard.. it’s interesting reading!) I was hoping to meet the author at Dinah Beach, where he apparently is a fixture, but alas, he is off again to places intrepid in his trusty, and austere vessel, Kehaar. We tied the dinghy to the floating pontoon, the tide went out and we could't leave for the next 5 hours.. There are plusses, as we settled into Dinah Beach dinners, $8 for fish’n’chips and $5 beers… this place is like the working man’s yacht club, with the odd intrepid sailor thrown in, no white shoes to be seen. :) They have live music 6 or 7 days a week, never heard any other "yacht club" doing that! Swimming area with croc net. 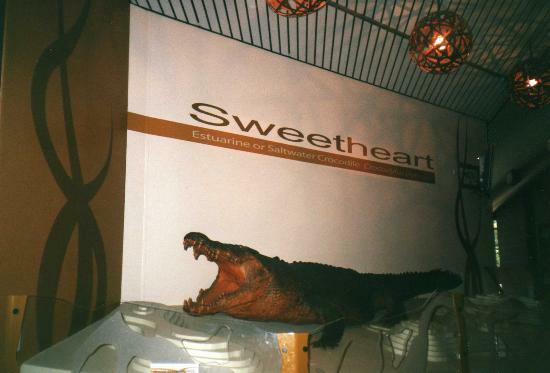 Of course we visited the museum to pay homage to sweetheart. No intrepid sailor passes through Darwin without doing so :). Maybe because the beast evokes such circumspection on one’s mortality, or lack of it in her jaws.. she being a 5m croc. I may be a little unfair, sweetheart never hurt anyone. Her aversion to outboards was her only crime, being 300 years old I would have thought she’d understand the temporary nature of human civilisation, if she kept low profile for the next hundred years, I’m sure she would have had her creek back to herself… instead of her eventual fate, under the knife of the taxidermist..
Everyone always told me that sailing around Oz was a seriously hairy-chested experience, but you guys make it sound easy ;-) Great to see you're still enjoying it all. Hi Annie, maybe it's because we aren't sailing the Southern end of the continent. The West coast isn't such a doddle either, it does make the rest of Oz look easy though. Hi folks, thanks for the comment on "Kehaar", we are currently in Venezuela.